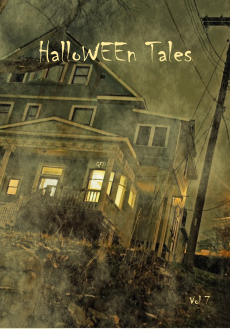 In Halloween Tales, Volume 7, published by Wee Tales by Golden Fleece Press, Sally's poem, "October," appears on page 25. 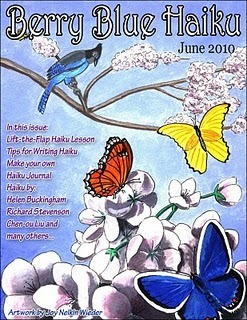 Berry Blue Haiku March 2011 issue features two of Sally's children's haiku and her name on the cover. One of her haiku is featured on the very first page! All issues of Berry Blue are now free to read online. 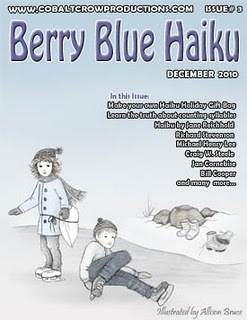 One of Sally's children's haiku is featured on page 4 of the Winter issue of Berry Blue Haiku, an online journal of children's haiku. 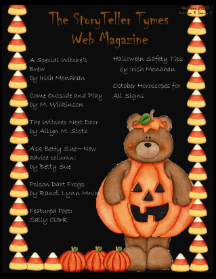 The cover of the October, 2010, issue of The Story Teller Tymes Web Magazine for Children lists Sally as their featured poet with five of her poems appearing inside: "Pumpkins A-Z," "The Legend of Stingy Jack," "Abba-Zaba-Yum!" "Scare-craw!" and "October." 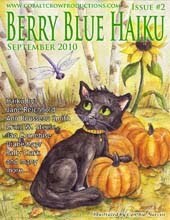 Sally's name appears on the front cover of the September issue of Berry Blue Haiku as a contributor, as well as five of her children's haiku inside! 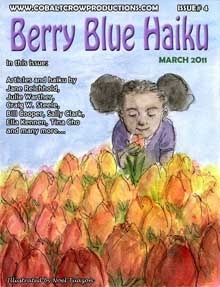 Berry Blue Haiku, an online haiku journal for children, features four of Sally's haiku in their premiere issue! Click on the cover to read the entire issue. Churchmouse Publications has five of Sally's children's poems for sale in bulk for church bulletins, newsletters, or magazines: Faithful in Little Things, Seasons, Ice Cream, Rainbow's End, and Stick Horse. 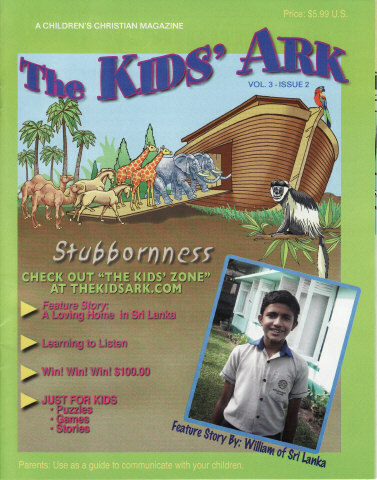 The Kids' Ark, a print Christian Children's Magazine, features Sally's story, "Learning to Listen" in their June, 2009, issue. 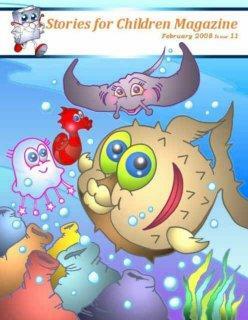 This is Sally's second story for this fine publication! 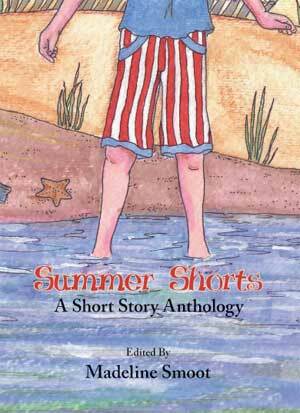 In August, 2006, Sally's poem "Ice Cream" appeared in Austin, TX, publisher Blooming Tree Press' children's anthology, Summer Shorts. 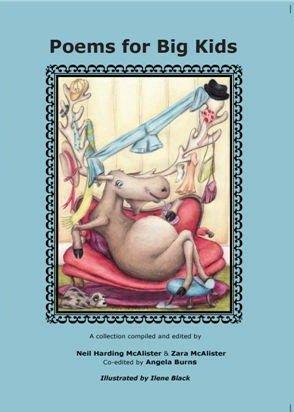 In April of 2008, "Rainbow's End," was featured in Poems for Big Kids, a poetry anthology for children edited and published by Neil McAlister. 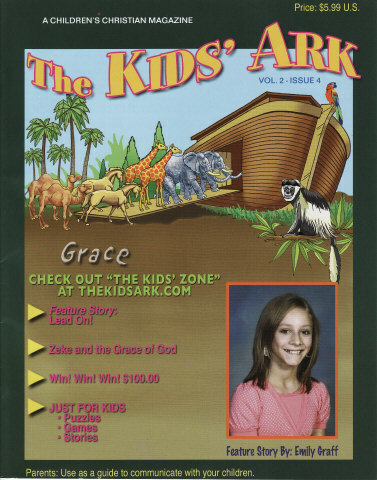 Christian children's print magazine, The Kids' Ark featured Sally's fiction story, "The Shattered Teapot" in their Dec., 2008 issue. Sally has contributed to two poetry study units for online store, The Highlights of Homeschooling , on Penguins and on Pirates. She has written 20 complete poetry study units for The Highlights of Homeschooling consisting of 30 poems each on a variety of nonfiction subjects including: The Texas Alamo, Cats, Dragons, Mice and Rats, Iroquois Indians, Lions, Knights/Castles, the American Girls book series, Butterflies/Ladybugs/Bees, Bears, Halloween, Princesses, Thanksgiving, Pumpkins, Westward Expansion, The Hobbit, the American Revolution, Marine Animals, Horses, and Where the Wild Things Are. In May of 2004, The University of Texas University Interscholastic League purchased Sally's children's story, "Queen For a Day" for use in their second-grade storytelling competition in the Fall of 2004 thru the Spring of 2005. Online children's magazine, Stories For Children, published three of Sally's poems: in November, 2007, "At the Campfire;" in December, 2007, "Seasons;" and in February, 2008, "Rainbow's End." Online magazine, Kidz Wonder, has featured articles and poems by Sally Clark in their October, November, 2007 and March, 2008, issues, including a non-fiction article about St. Patrick. Her poems "Ice Cream," "Hot Summer Days," and "In The Car," appear in the July, 2009 issue of Kidz Wonder.